How To Set Eco-Friendly Marine Aquarium and Looks Amazing! As we discussed in the last post on three reasons you might not want to own a marine aquarium, there is a very real negative environmental impact that the salt water aquarium trade has on coral reefs. Most of the fish, live rock, and invertebrates and a good percentage of the corals sold today come from the wild. The collection of these wild specimens and the collection methods themselves can have a devastating impact on the reef. However, it’s possible to stock a thriving a fish tank made up exclusively of aquacultured or captive raised fish, live rock, and corals. The good news is that if you’re looking to set up a marine fish tank that’s environmentally friendly and looks great too, it’s not too difficult to do. The number of captive bred and aquacultured livestock available for salt water fish tanks is expanding at a healthy clip. While most live rock still harvested from the wild, it is possible to purchase aquacultured live rock. I’ve done this before and was very pleased with the quality of the rock that shipped to me. The rock had beautifully colored pink and purple coralline algae, small coral and anemone polyps, plus some an urchin and small crab hitchhiked their way along as well. I got this shipped from Tampa Bay Saltwater and would recommend them to anyone looking for high-quality live rock for their saltwater aquarium. Less than 10% of saltwater fish are captive bred. However, advances are being made, and you can still get an excellent selection of fish to populate your aquarium by selecting from the captive bred options. 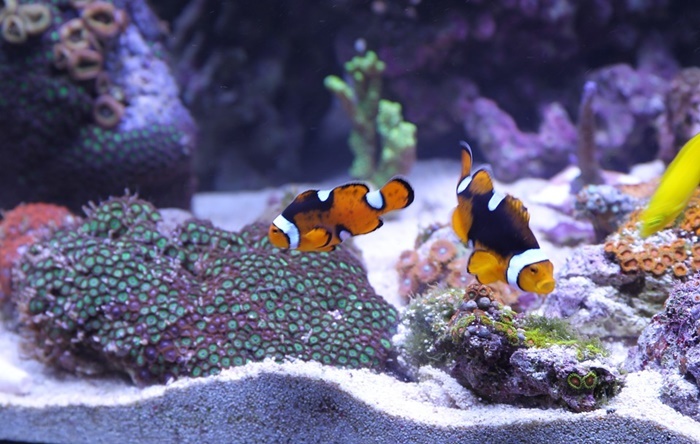 For example, most Clownfish (a very popular aquarium species) as well as Neon Gobies and Dottybacks, are aquacultured. You may be able to find these aquacultured species at your local fish store (they’re usually labeled “tank raised” or “captive bred”). If not, you can order them online from various sources. Probably around 1/2 of all corals sold today come from the wild, for example, Bubble Coral. However, the percentage of hard and soft corals that come from individuals and companies that use fragmentation to grow corals for resale is increasing. It should be pretty easy to find a wide selection of aquacultured corals for your tank. Again, you can check with your local fish store or find some site online that sell them. Also, you can search out a local marine aquarium club and see if any of their members have corals they’ve propagated that they’re interested in selling. Other than some species of clam, it’s still pretty difficult to find aquacultured inverts for the marine aquarium. Hopefully, this will change shortly. While aquaculture species usually cost more than their wild-caught cousins, you’re rewarded with hardier specimens that are better for the environment. And with the options of fish, corals and live rock that are available, you can put together one incredible looking reef fish tank made entirely of captive raised specimens!